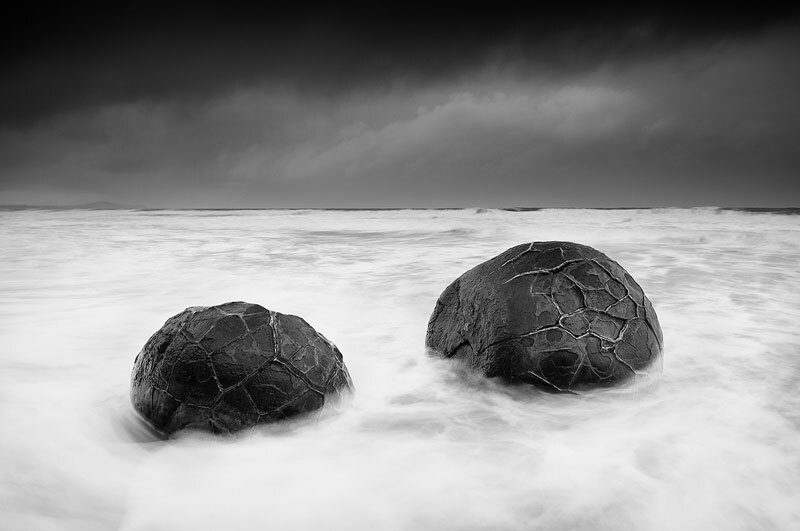 Moody black and white photo of The Moeraki Boulders. | Moeraki Boulders, Moeraki, New Zealand. Moeraki Boulders, Moeraki, New Zealand. The Moeraki Boulders are unusually large and spherical boulders lying along a stretch of Koekohe Beach on the wave cut Otago coast of New Zealand between Moeraki and Hampden. I was here for both a sunset and sunrise and was hoping for a wicked light show, but that never happened. Instead I was presented with interesting and moody light that I knew would look good in black and white. I'm pleased to present five slightly different images from this location that I really enjoy.